A new school year brings with it many things- new backpacks. New uniforms. New teachers. And for some of us it brings new experiences. When you first set out to prepare your kids for their FIRST first day of school, a million questions pop into your mind. 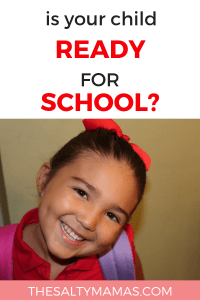 Is my child ready for preschool? What does my child need to know before TK starts? Will they be okay without me? As a former teacher, I was surprised to find that I had exactly the same concerns when my daughter went to school for the first time. I felt like there were soooo many things I wanted to teach her before school started- and believe it or not, letters and numbers were the least of my concerns! When it comes to school readiness, there are more important things to focus on (things like independence, how to get along with others, and fine motor skills) that will free up the teacher’s time to teach academics. So if you find yourself wondering, “What does my child need to know before TK starts?” Well, here’s ten things that you can teach your kids before school starts that your child’s Kindergarten/TK/Pre-K teacher will LOVE you for. This post includes affiliate links, which means we’ll earn a small commission off of in made by clicking through. Thanks for supporting The Salty Mamas! This is a really, really hard thing to teach whole group, but a fun and easy thing to teach one-on-one. Start by teaching them to recognize their name in print, and then move on to learning each of the letters that make up their name. Spend a little time having them trace their name before having them move on to writing it solo. And feel free to leave the paper and pencil approach until later-there are a TON of ways to make learning how to write your name lots of fun. Check out this list of Practical Name Writing in 12 Fun Ways by Hands On As We Grow. Similar to the skill above, scissor skills are really tricky to teach when you’re no longer one-on-one. Show your kiddo how to hold the scissors, to use them safely, and to move the paper (not the scissors) as they cut. You can draw lines on paper for them to practice with, or buy this colorful activity book that gets progressively harder with each page. Now listen, we LOVE a kid who colors outside of the lines. BUT, there are times when coloring inside is important, too. Help your child to learn the difference between coloring for fun and coloring on schoolwork. Help them to decide when to use “realistic colors” versus when they can go rogue. Any coloring book can be used for this, but this fun book really narrows in on these skills. Let’s save the poor teacher some mess, yeah? Can you imagine cleaning up after thirty kids with glue bottles? Let’s don’t do that to him or her. Work on squeezing the glue bottle just a little (we use the phrase “Dot, dot. Not a lot!”). This exclusive, Salty Mama printable can help your kiddo to practice this skill, along with a few others on the list. Also work on using gluesticks. Need more help with that one? This cute little craft kit will give your child plenty of practice- and they won’t even know they’re working on school readiness skills! 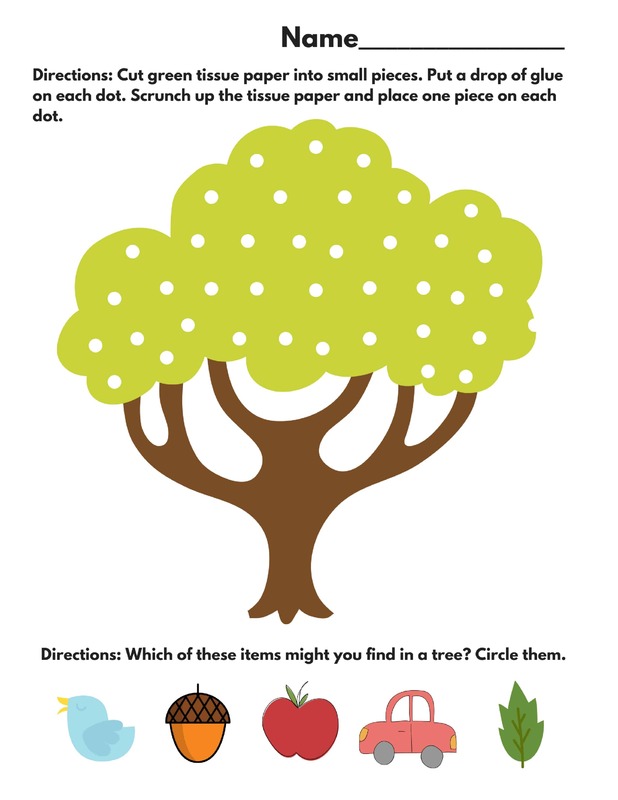 You can work on several school skills at once with this fun printable craft! Get yours here! I don’t want your child’s teacher to have to run around to each student and show them how to hold a pencil. Think of all the time wasted! Have your child practice using a functional grip (on or two fingers on top of the pencil, with the thumb underneath). Is your child struggling? Use shorter pencils or crayons, which eliminates some of the other, less useful grips. Need more tips on how to help with this? Head on over to Living for the Sunshine to read more about ways to practice. Okay, this is a weird one, but there are a LOT of school crafts that involve folding a paper in half. Practice folding length-wise and width-wise (like a “hot dog” or a “hamburger,” if you remember from your school days). You can have them practice their scissor skills on their folded paper by tracing a half-heart and letting them cut it out. I am no fan of workbooks personally, but there are going to be plenty of them at school. Grab one from the dollar store or the Target Dollar spot, or order a fun one here. Kids can practice valuable school-skills like circling an object, drawing lines from one item to another, and finding the line where they should write their name (or writing on the top right-hand corner if there isn’t one). Can you imagine the first-day-chaos if none of the kids could do this? Practice opening and closing backpacks with your kids, and make sure they are able to open any containers/packages that you plan to send to lunch with them. There’s not a ton of time to eat, and you probably don’t want your kid waiting the whole lunch period for it to be their turn for the lunch aide to open their Pirate’s Booty or juice box. Big kid school is not like little-kid-preschool or daycare- there just aren’t enough grown-up hands to assist with these tasks! Help your child to become independent with their own zips/ties/snaps. And avoid sending them to school in shoes with ties until they can retie them on their own! I mean, I’m just saying. I can almost guarantee that wiping booties was not a part of your child’s teacher’s credential program, and someone’s gotta get it done. It’s gonna have to be your kid, so get to work on this one- stat. By teaching your kids just a few simple things, you won’t have to wonder “is my child ready for TK” or “What do I need to teach my child before TK starts?” Spend the summer doing fun, simple activities (check out our sample schedule that will help you cover all your bases every day! ), and hug those little ones tight. Fall will be here before you know it, and checking these items off your list will ensure that at least one of you will be ready when it comes! I would have loved to have access to this when I was struggling in school. My hand writing was almost never legible so my free time was dedicated to practice. Parents never really think you have to practice the things teachers will be showing them, but it’s always better to be ahead. Thank you for bringing such an important perspective! And I agree with you, there are some things teachers just can’t do- too many students, and too little time! I’ll be absolutely trying to teach my kids these skills before they go to school! I never put any thought to these subjects and have to admit it all makes a lot of sense…and forget about cleaning after 30 bottles of glue. Think about wiping 30 BM…??? Oh my gosh, right?? That’s literally all they would do all.day.long. Yes, yes, yes! Especially to packing their own backpack (we spend such a huge part of our day training kiddos to do this during the first few weeks) and of course, the bum wipe! Thanks for the link! You guys are the best! So proud of my little girl (that would be you Jaymi) for making me so proud. I can’t believe my sweetest little granddaughter will be starting school (sniffle, sniffle). Go on take on this old world Lila. I know you are more than prepared for it with a mama like yours. It’s so crazy, isn’t it? I like to think we’ve prepped her pretty well, but ready or not? Here she comes! I love your blog!!! Found you via Darlene. Thanks for reading! Thankfully it’s one little step at a time. We’ll get them there- eventually! Hey thanks, Former Teacher! I knew about cutting and glue and stuff, but I never thought about folding a paper in half! Cool printable too! Thanks, Darlene! Folding paper is one of those things that seems so easy but is so.stinking.hard for kids! As a former teacher, I laughed and agreed with the folding paper! Even sixth graders struggle with this skill! Great list. Haha, right? Why is folding paper SO HARD?? Great list! I wouldn’t have thought of half of these! This is a great list! I wouldn’t have thought of half of these! Right? The things we take for granted! Wow, I hadn’t thought of many of these! I’ll be working on these skils with my preschooler. Luckily most of them are fun. Enjoy! Wow, this is such a great list that we don’t really think about very often. Thank you for sharing. Of course! Sometimes the little things are actually the big things ? Absolutely! A few lesson ideas in here for sure! It seems like all of these are the foundations for academics, especially the pencil writing. My daughter knew most of these before kindergarten. Shoe tying is next for us! Excellent point! They are definitely “preacademics” as we used to say in my old school. And I’m scared of taking on shoe tying. I’d love any pointers if you’ve got em! aw these are such great skills to prepare a kid with! I’m gonna have to share this with my sister, because I think my nephew could definitely benefit. I have 2 soon-to-be preschoolers and we are working on #10! It’s a tough one ? I have two soon-to-be preschoolers and we’re working on #10! I knoooowwww! Why is it so hard to get the hand of?!? Thank you! Luckily most of them are fun to work on… Key word MOST ?